Original front cover. Copyright BBTBhagavad-Gītā As It Is is a translation and commentary of the Bhagavad Gita by A.C.Bhaktivedanta Swami Prabhupada, founder-acharya of the International Society for Krishna Consciousness (ISKCON). It is known amongst other translations of the Bhagavad Gita for its strong emphasis on the path of bhakti yoga above all others, in line with the Gaudiya Vaishnava tradition of Caitanya Mahaprabhu. The book has been widely distributed, largely through promotion by the modern Hare Krishna movement. It was first published in 1968 by Macmillan Publishers, with an unabridged edition in 1972. It is now published by The Bhaktivedanta Book Trust and is available in nearly sixty languages. 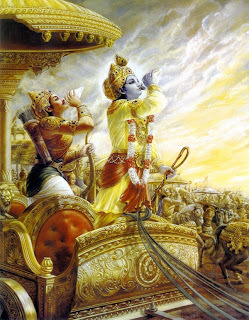 Arjuna and Krishna as depicted on the 1980s cover of Bhagavad-Gītā As It IsFor each verse, the book (in complete editions) includes the original devanagari script, a Roman transliteration, word-for-word Sanskrit-English meanings, and English translation. An extensive commentary by Prabhupada is given throughout, based on various Gaudiya Vaishnava works, including: Ramanuja Bhasya (in Sanskrit); Sarartha-varsini-tika (Sanskrit) by Visvanatha Chakravarti Thakura; Gita-bhusana-tika (Sanskrit) by Baladeva Vidyabhushana; and Bhaktivinode Thakur's Bengali commentaries. Thus the book advocates the path of bhakti toward Krishna, who is seen as identical to Vishnu, in direct opposition to monistic interpretations. This has led to criticisms from a number of figures who disagree with Prabhupada's literal approach. Sivarama Swami refutes its criticisms in his book Bhaktivedanta Purports: Perfect Explanation of the Bhagavad-Gita, ISBN 1-887089-12-8, Torchlight, 1998. Bhagavad-Gītā As It Is is written in the tradition of Gaudiya Vaishnavism, and the members of ISKCON consider the book authoritative and literally true (mukhya-vrtti). Like the majority of other Hindu traditions, Gaudiya Vaishnavism regards the Bhagavad Gita as the essence of the Vedic knowledge and the Upanishads. Some editions of the Gita come with prefaces by Allen Ginsberg, George Harrison, and Thomas Merton. This translation is probably the one most sold outside India due to the efforts of the conspicuous Hare Krishna devotees on the streets, in airports, and in other public places. The book also enjoys brisk sales within India. It has been published in fifty-eight languages, including French, German, Spanish, Portuguese, Italian, Swedish, Russian, Polish, Czech, Slovak, Latvian, Macedonian, Hungarian, Croatian, Chinese, Japanese, Arabic, Hebrew, Persian, Hindi, Bengali, Gujarati, Kannada, Malayalam, Oriya, Tamil, and Telugu. Socially, Bhagavad-Gītā As It Is suggests a way of life derived from the Manu Smriti and other books of Hindu religious and social law and applied for the contemporary Western world. In this way of life, ideal human society is described as being divided into four Varnas (brahmana - intellectuals, kshatriya - administrators, vaishya – merchants, shudra - workers). Within his writings Prabhupada supports the view that one becomes a member of one of the Varnas not by birth but by one's personal qualities (guna) and the type of work (karma) one actually performs (BG 4.13). Society is described as best ruled by a benevolent kshatriya sovereign, who is to govern according to rules set by scriptural tradition and preserved by self-controlled and pure-hearted spiritual leaders (brahmanas). The kshatriya sovereign (like courts in many democratic states) may also order capital punishment. Brahmanas, elders, women, children and cows are said to deserve special protection, with animals, especially cows, being preserved from slaughter at all costs. Prabhupada encourages readers to adopt a lacto-vegetarian diet and gives agriculture as the ideal economic basis of society. Ultimately Prabhupada gives the conclusion that society should be "Krishna conscious" -- enlightened by devotion (bhakti) to Krishna (God). Because Prabhupada writes from the viewpoint of the Gaudiya Vaishnava sampradaya, some regard Bhagavad-Gītā As It Is as being a sectarian work, with the translation and commentary written as to present Gaudiya Vaishnavism as the correct path preached by Krishna in the Gita. Some of the verses are not so much translations as they are interpretations with a Gaudiya perspective, using English words not found in the original Sanskrit to convey a particular message. Prabhupada often translates the Sanskrit word deva ("god") as "demigod," a translation many Hindus find objectionable. However, when the word deva refers to Krishna, he translates it as "Lord". ^ Rosen, S. "The Macmillan Miracle". www.krishna.com. http://www.krishna.com/en/node/1523. Retrieved 2008-06-02. ^ a b The Bhaktivedanta Book Trust offers a 2006 "summary PDF file showing which books have been translated into which languages.". www.krishna.com. http://www.bbt.info/files/languages/Books_in_Print_JUN06.pdf. Retrieved 2008-05-30.